Situated on a promontory on the sheltered western side of the Dart Estuary, bordered to the north by Old Mill Creek, Dartmouth, in the south of Devon, has a mild maritime climate ideal for many interesting coastal insects but access can be difficult and the area is probably under-recorded. On the rocky coast nearby the Nationally Scarce Green Snail Ponentina subvirescens can be found. This air breathing land snail is a south west speciality and an IUCN red-listed species. This coast is also home to the rare ant Leptothorax albipennis, and such typical coastal species as the nationally notable Thrift Clearwing moth Pyropteron muscaeformis, the nationally scarce Grey Bush-cricket Platycleis albopunctata, the ground beetle Harpalus tenebrosus and the seed bug Megalonotus chiragra. Walking along the hedges might disclose the tiny cribellate spider Nigma puella making its little web of fluffy silk in which to entangle small insects. The False Widow spiders Steatoda grossa and Steatoda nobilis can be found here as in many of the ports in Devon. Two distinctive harvestmen can be found Megabunas diadema and Dicranopalpus ramosus. 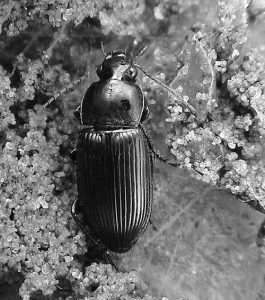 This latter species, with its forked palps has recently been discovered to be two species and which occurs at Dartmouth is not yet known. Close by, at Outer Froward Point and Kelley’s Cove, a very rare muscid (house-fly) Helina deleta can be found, a recent record of Rob Wolton being probably only the second in Britain. At their usual habitat of freshwater seepages on hard coastal cliffs are the Nationally Scarce dolichopodid fly Dolichopus signifer and the pretty cranefly Dicranomyia goritiensis, which was once considered rare although the NBN Atlas gives a continuous distribution from the Solent to Anglesey. 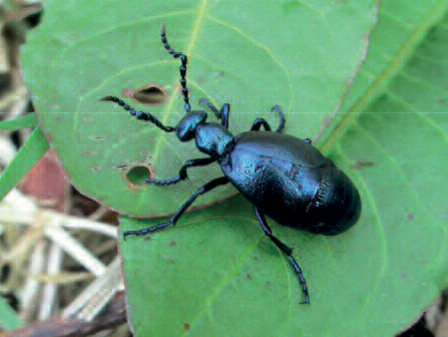 Also typical is the Violet Oil Beetle, Meloe violaceus and the Rose Chafer, Cetonia aurata. The road to Dartmouth Castle is home to the native and Nationally Scarce Wild Cabbage Brassica oleracea and this is the food plant of the Olethreutine moth Selania leplastriana, a micromoth which is found in only 10–15 km squares in Britain. Dartmouth is also the location of the first record in Britain of the macromoth The Geometrician Grammodes stolida. Found sugaring amongst bramble on 23 September 1903 this beautiful moth has only ever been recorded once since, in 1990 in East Sussex. This Mediterranean species feeds on bramble and oak – so might it eventually colonise? The Devonshire Wainscot moth Mythimna putrescens is found here, it is very local and rarely found outside Devon, Cornwall and Pembrokeshire. Recently the Bloxworth Snout Hypena obsitalis has colonised the area – a significant westward expansion of its range as a resident in Britain. With many thanks for contributions by Keith Alexander, Martin Drake, Bob Heckford, Barry Henwood, Martin Luff, Matt Prince & Dave Smallshire.